Rare Find! Beautiful Grand Bungalow on a Large Corner Lot! Front Porch, New Flooring and Railings and a Relaxing Hammock to Lounge in! Located in the Historic Old Southeast Neighborhood. 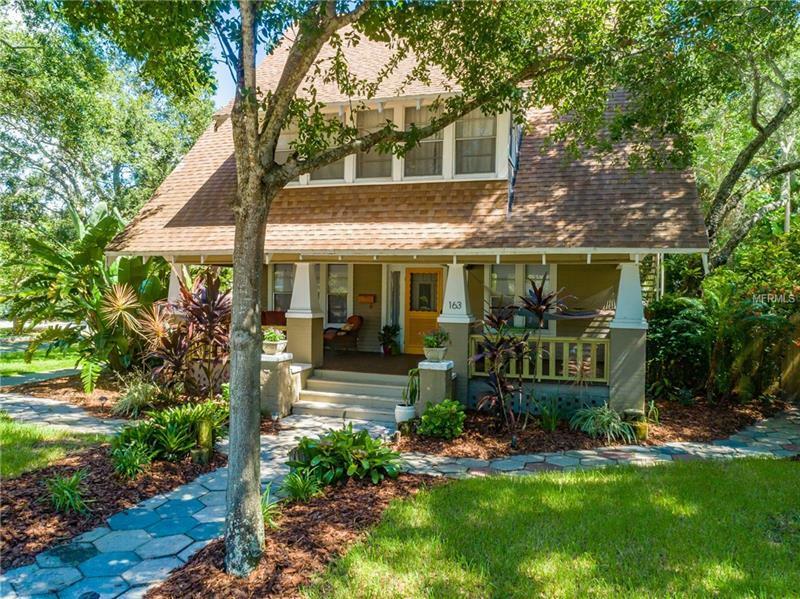 This Home is of the Largest Bungalows in St Petersburg with 3 Finished Levels, Tall Ceilings, Magnolia Hardwood Floors and much more Turn of the Century Charm off a Brick Street! This Home has been Inspected and Corrected, with 1 yr Home Warranty for Seller and Buyer peace of mind. First level Living area for Entertaining, Cooking, Dining, Listening to Music and catching up on some Office work and Laundry. Up the Stairs pass the Stain Glass Window, is the Large Master Bedroom and an Amazing Oversized Dressing Room with Abundant amounts of Natural Light and 2 Walk in Closets! Two More Sleeping Quarters on this Level and a Full Bath. One Guest Room with its Very Own Sitting Area! Exit Door with stairs in case you want to by-pass the front door and go straight out the back. Next Level has another Bedroom, Office, Loft or Craft Room with Lots of Storage and a Half Bath. Prior owner Updated Electric and Plumbing. Current Owner has Secured all crawl spaces, added New Insulation, New Washer and Dryer, Refrigerator, New Kitchen Flooring and New Porch Flooring, Railings and More. Location! Minutes from Beach Drive, Blocks from the Water, Bike ride to all the Parks, Attractions and short distance to USF, Hospitals and Dining. Don’t Miss this opportunity to own a piece of History in Old Southeast, St Petersburg. Live the Lifestyle!